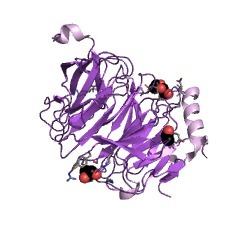 This N terminal domain is found in BOP1-like WD40 proteins. This domain is found in the N-terminal region of BOP1-like WD40 proteins. Bop1 is a nucleolar protein involved in rRNA processing, thereby controlling the cell cycle [(PUBMED:16362343)]. It is required for the maturation of the 25S and 5.8S ribosomal RNAs. It may serve as an essential factor in ribosome formation that coordinates processing of the spacer regions in pre-rRNA. There are 1684 BOP1NT domains in 1683 proteins in SMART's nrdb database. Taxonomic distribution of proteins containing BOP1NT domain. This tree includes only several representative species. The complete taxonomic breakdown of all proteins with BOP1NT domain is also avaliable. Click on the protein counts, or double click on taxonomic names to display all proteins containing BOP1NT domain in the selected taxonomic class.